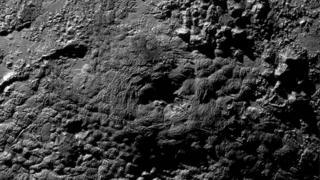 Two possible ice volcanoes have been identified on the surface of Pluto. They are seen in images returned from the New Horizons probe, which flew past the distant dwarf planet in July. The mountains are several km high and tens of km across, and each has what appears to be a depression in the top. Unlike Earth volcanoes that spew molten rock, Pluto's volcanoes - if that is what they are - would likely erupt an icy slush of substances such as water, nitrogen, ammonia or methane. The suggestion was raised at the 47th annual meeting of the American Astronomical Society's Division for Planetary Sciences, where the mission team is presenting over 50 research reports from the flyby. The scientists still need to do further work to confirm their volcano idea. What would help in particular is information on the composition of the materials making up the local terrain. "If we can constrain the compositions of these features then we'd have something to work with, with respect to modelling how this particular ice would behave if it were to be erupted volcanically, and what sort of relief it might be able to sustain," said Dr Oliver White from the US space agency (Nasa). This information may come in due course. New Horizons has not yet returned all of its data from the July encounter. Only about 20% of its observations have so far been downlinked to Earth. But if cryo-volcanism can be established, it would be an immensely exciting discovery. While the phenomenon has been postulated to occur on several outer Solar System bodies, nothing really convincing has been detected; certainly not in terms of mountain-building. The two candidates at Pluto are found just south of Sputnik Planum, the smooth plain on the planet's equator. They have been informally called Wright Mons and Piccard Mons. On Earth or Mars, their shape recalls shield volcanoes - broad, tall edifices that develop from repeat eruptions of low-viscosity fluids. As well as their putative calderas, they display a hummocky texture on their flanks that may represent old "lava" flows. How recently they might have been active, though, no-one can say currently. Pluto is a small body that should have lost most of its heat to space over the course of Solar System history. That said, not a lot of energy would be required to melt and mobilise the cocktail of ices that coat the planet. "It's just astounding that in all of the exploration that we have done, that the nearest neighbour analogy to these constructs occurs on Mars," commented Prof Alan Stern, the principal investigator on the New Horizons mission. "You have to look all the way to the 'other Red Planet' to find something similar. "Across all the worlds of the middle Solar System, we've seen nothing like this. It's truly amazing." It is now almost 120 days since New Horizons made its historic flyby of Pluto and its moons. In that time, the probe has moved 140 million km deeper into the outer Solar System, some five billion km from Earth. Mission managers last week oversaw the last of four engine burns that put the spacecraft on course to meet its next target - a small icy body known simply as 2014 MU69 - in just over three years' time. However, the team does not yet formally have funding from the US space agency to operate the probe at the roughly 45km-wide object. A science proposal to win that support is likely to be submitted to Nasa some time next year. Meanwhile, the Pluto flyby data will continue to trickle down to Earth. It is taking so long, in part because the vast distance to New Horizons limits bandwidths, but also because the mission must share time on Nasa's deep-space communications network with other probes trying to relay their data back home.